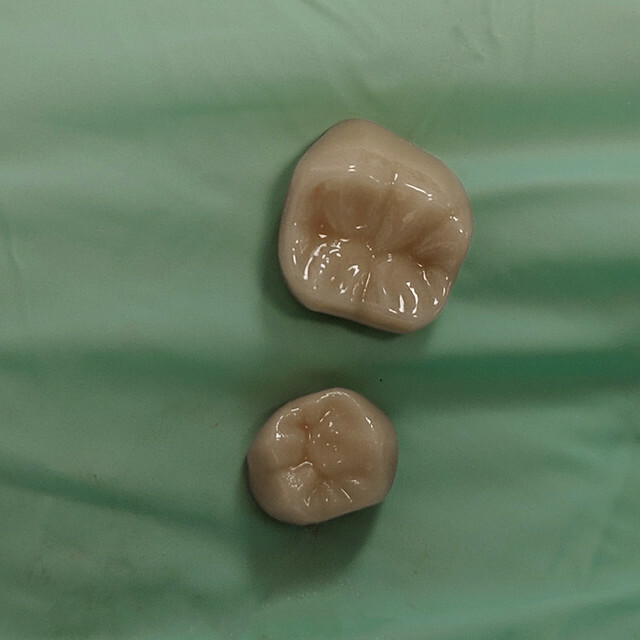 These are crowns for a molar and pre-molar, respectively, from top, and the teeth they were applied to are right next to each other in my mouth, which is why I got them at the same time; didn’t seem much point to getting just one of them done. These are my first crowns, so I guess I should be happy that I made it this far without any, but as I was noting elsewhere, the funny thing about teeth is that ultimately they’re going to do what they’re going to do. I brush and floss daily and I still needed these. Such is life. We’re fortunate to be a place where I can get good dental care without having to worry too much about the cost, which is good, since at the moment we’re out of pocket with our dental insurance and I had to pay full freight on these babies. I hope they’re worth it. In the meantime, I’m not allowed to eat sticky things for an entire day, which is fine because I don’t really feel like chewing at the moment. I suspect dinner will be soup. No peanut brittle for you, sir. So very happy for you. Congratulations on your (double) coronation. You have some serious coffee stains if that is supposed to match your teeth. BTW, the evidence says flossing does nothing. When I read that two years ago, I stopped. My checkups have been unchanged. What does make a little bit of difference, but not much, is those interdental brushes so I use those about once or twice a week, ever since I closed my no-flossing experiment. I floss because, aside from any other reason, I have pockets where food hides, so if I don’t floss my breath eventually rivals that of a komodo dragon. Also I don’t drink coffee. I asked my dentist about the tooth color and he said everyone’s natural teeth color varies, not only from person to person but from tooth to tooth. I’m with you that the teeth do what they’re going to do when they are ready to do it. My sister got a full set of dentures at 42. My brother is 59 and went in for 17 implants. His experience was…suboptimal and I believe he’ll be getting full dentures next year. My other 2 sisters and I are getting the occasional crown or root canal, replacement fillings occasionally but, nothing massive. My parents also have most of their original teeth. Genetics is a fickle beast. Definitely avoid those big toffee wheels they put in boxes of Quality street! Only that you’re reminding me that I have to get some dental work too that I’ve put off for a shamefully long time. One molar and a lower tooth with a gnarly cavity. Gotta steel myself for this. I promise I’ll do this when Trump is impeached. I’ll only say that you have embarked upon a course where, if you felt you didn’t have quite enough character, you will soon be more than satisfied. I was thinking yesterday, during the prep for just one of these (old molars full of fillings start to break down and break up later in life), that people are actually rumored to get these things done for cosmetic purposes. That’s taking the old “suffering for beauty” thing way too seriously. I had five extractions and four implants just a bit over five weeks ago. Not my first by a long shot. Dental insurance (which I have) covers only a small fraction of the cost; this latest batch will set me back about $30K (negotiated down from nearly twice that). I’m still eating only soft food until the oral surgeon tells me the implants are stable. For a once-fat person, I now find it difficult to keep my weight up. Good start! Crowns are a nuisance. Most of my gold ones are now replaced with porcelain, but the dentist says I need 8 freshies, including replacing one that his predecessor installed three years earlier. I’m not impressed, and am considering a second opinion. My two implants are much easier to deal with. Welcome to the club, John. My wife and I are both having crowns at the moment. A lot better than not having teeth. I don’t know about your dentist, but mine has a crown making machine that allows him to prep the tooth for the crown, build it and put it on the tooth in roughly two hours, which is much better than the old days, where I got my tooth prepped, had a mold taken of my mouth (it smelled bad and the material made me gag), a temporary crown was made, and a couple weeks later, the permanent crown was placed on my tooth. Hooray for aging. I turned 40 last month and today found out I need bifocals. I’m lost somewhere in my sixties. Had caps and they lasted about ten years. I recently opted for dentures and, of course ended up with the Holidays messing with the time schedule of getting my permanents. I hope they are worth it. Currently waiting for for the metal base that the lower partial will be molded over and fitted. Decided against implants because one report I saw says that fifty percent of them get an infection. Seventeen percent need to be removed within a year. If you have implants, pay attention to any discoloration of the gums, or pain. Get it checked out. A bone infection is devastating. Waiting for the day when dentists can implant a tooth bud from your own dna and you get a new, all natural tooth. Knew someone who was obsessive about brushing, flossing, you name it. And they ended up with a couple of crowns by 40. My Wednesday was productive, thanks for asking. Had a software update done to the vehicle we bought last year, got a free oil change in the bargain, and made hotel reservations for WorldCon, plus made the long-distance provider we use at work VERY unhappy by catching another batch of billing errors (in their favor, oddly enough, go figure) and deducting them, so not bad for a day’s effort. I sympathize on the crowns. I inherited my mother’s rock-hard enamel and have had maybe two cavities in my entire life, then a couple years ago around the time I turned 60, one of my back molars just broke in half while I was eating breakfast one day. Even with dental insurance, the crown still set me back nearly $2K, and because I’ve got hypersensitive gag reflexes, it took heavy sedation to get through the process without puking on the dentist’s shoes. I have no desire to repeat the experience, but realistically speaking, it’ll probably happen again at some point. I hope you are fortunate enough that these are an anomaly rather than a trend. Enjoy your soup, sleep well, and stay away from peanut brittle. A couple of things from my dental experience. 1. After a couple of reasonably successful crowns capping root-canalled teeth, my (former) dentist talked me into a crown on a worn but still passable molar. Unfortunately because of general wear, there wasn’t a whole lot of tooth to install the crown to….so it stuck up more than it should, while at the same time it didn’t have enough contact surface to stick. It’s come loose at least three times. Fortunately I have not swallowed it. Also, the tooth underneath isn’t particularly sensitive. But it’s almost impossible to fix without some large scale work capping many other teeth to make the bite even. It’s not a project I’m willing to undertake yet. When I had my crowns put in, the “best case” presented to me was to get gold crowns on molars (and I had most of my molars done that way), and for premolars to do a color-match ceramic crown since that position is more visible. By looking at that that one [formerly] color-matched premolar crown of mine, I can tell how much less white my teeth have become since then. So I guess John’s crowns will reverse that process — mismatch now, match later! Remember the tooth! THE TOOTH! I was fortunate in the genetic lottery, and only have 3 cavities and all my wisdom teeth, which tends to freak out dentists. Switched dentists about 4 years ago after I noticed our original dentist getting more new fancy equipment and an uptick in recommended cosmetic procedures. Still not sure if the mouth guard he prescribed for me almost a decade ago was necessary (if I were grinding my teeth that hard, wouldn’t I have bitten through the thing by now?) My only concern is ‘getting long in the tooth’, i.e., receding gums, which luckily seem to have mostly stabilized. Wait, flossing doesn’t work? Did I learn anything in my childhood that’s still true? I was terrible about brushing and flossing as a kid. Back teeth are full of fillings. Did better once I got out of grad school. I floss rarely now, but do it daily for about a week for a hygienist appointment. Works great! I have a few crowns, which are lasting well. Meanwhile, my partner goes to a different dentist, has had more crowns and more of them have failed/fallen off/turned out a root canal should have been done/etc. I would never go to his dentist. We have fraternal twins. One has had no cavities so far. The other sucked his bottle too much as a baby and got 4 crowns as a 2 (or 3) year old and has had a few cavities since. Yay, genetics! Salt water taffy pulled one of my crowns loose once, so I’ve avoided that since then. I noticed someone mentioned a bite guard earlier in the comments; I’ve had one since 1988 and am on my second one after wearing through the first one at about 15 years. If I’d had it earlier, I might not have had to have my rear molars crowned, since tooth grinding weakens the enamel at the gumline and that’s where my cavities were (and my mother’s as well). Just last year I had to have a crown replaced after 30 years since my current dentist couldn’t remove the old one to get to some decay that sneaked in under it. But crowns beat having no teeth for sure. For many years I didn’t take proper care of my teeth or go to a dentist. Followed by a tooth breaking while eating a piece of Gouda cheese. Followed by a couple thousand dollars out of pocket (and I have excellent dental insurance). Now I take care of my teeth and go to the dentist thrice yearly. As for how my Wednesday went, I’m on vacation in Costa Rica and spent Wednesday adventure touring. Today is more beach time after the early morning surf session. Congratulations on your new teeth! I got my first four crowns at 17 and now at 43 I have a mouthful of the suckers. I hope they are soon forgotten about in your mouth and it is like they were always there. And, if you dentist is as good as mine, those will last you your lifetime. My original crowns are still in place and look to last for a good while longer. Right this minute sitting in my dentist’s waiting room having had a crown removed and a little decay cleaned out, with impression taken for new crown to go on next week. It took rather longer than expected as it was bonded so well my dentist had to drill almost every scrap of it off rather than being able to pop it off – a testament to my dentist of 15 years ago. Ever wonder why teeth are shaped the way they are? I mean, look at those bad boys. . . like tiny canyons just waiting to be filled with sticky yummyness. Ah, John, you sweet summer child. I had my first crown (because of my first root canal) at 11. I have now lost count of the number of root canals (and crowns) I have had–over a dozen, I think. A new dentist once looked in my mouth, shook her head, and said “I’m so sorry.” Apparently, I went to the wrong ancestor for the genetic information about teeth. Despite decades of good care and excellent dentistry, teeth gonna do what teeth gonna do. May these be your first and only crowns. Teeth are shaped the way they are because for 98% of the time humans have existed on the planet it was unusual for them to live long enough for tooth decay to be a first-order problem. Ah, crowns. I have (I think?) three. I’ll have to say, chronic illness has given me a new appreciation for dentistry: something breaks, you go in, endure some discomfort for an hour or two, possibly a couple of times. But then, boom! You’re done! Problem solved! I also find it to be a crowning* irony of modern dentistry that (for me at least), by far the worst discomfort comes from the application of the anesthesia. I have one implant in the upper front position. Remarkable artistry: the only way you can tell it’s fake is if you look really closely at the gum interface, or can see the back. Other than that, indistinguishable from original issue. Generally been satisfactory, but removal of the decayed tooth messed up the gum/bone next to it, and I had to have bone restoration done there. I’m mildly obsessive about keeping the area clean, as it collects Stuff, and my dentist tells me the key to implant longevity is hygiene. WRT flossing, my understanding of the news was not that “flossing does nothing.” Rather, it’s “there’s no research supporting the merits of flossing”, which is to say, The question hasn’t been researched one way or the other. A subtle but important distinction. I lost a tooth with each child (so… 2 crowns). My dentist says that is not unusual. Pregnancy, man. I hope you got the royal treatment when you got your crowns. I brush and floss daily and I still needed these. And some of it is just genetics and/or dumb luck. My mother and father both had almost identical tooth-care regimes. My mother had a full set of false teeth at 60, my father is 83 and still has only one filling. He has rather yellowish enamel, but he can bite through an anvil. My mother’s teeth were beautifully white, but fragile. Of the four possible colour/strength combos, just guess which one I inherited?